Cheers To Good Things In 2016! Did Santa bring you lots of fabulous beauty gifties in your stocking? Have you recovered from ringing in the new year with bottles of bubbly? Did you have to go back to being a responsible adult again today? 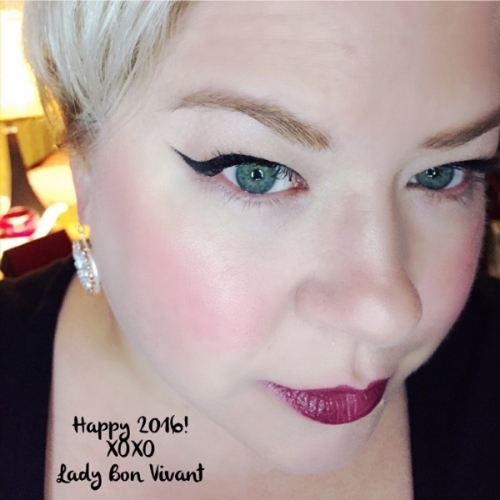 Alas, I did too... but I won't let it get me down for long as I am VERY excited about what's to come for Lady Bon Vivant in the coming year. Tell me more, you say? Well, I've been testing drugstore primers for the last few months to kick off my Full Face Drugstore Challenge - my favorite so far is the Rimmel London Fix and Perfect Pro Primer. The challenge will be fun; I can't wait to write about some of the drugstore products I already love and to discover new goodies to share with you along the way. And now that the temperatures are finally falling here in Cleveland, I'll also be posting soon about some of the winter skin care products I can't live without. But I'm most jazzed about the steps I've been taking to start providing my personal beauty consulting services to clients, starting later this year. Working with women to live their most beautiful lives has been a dream of mine for some time now and I get one step closer everyday to making it happen. If you or a friend or relative in the Cleveland area are looking for someone you can trust to guide you through the world of cosmetics and skin care, whether cleaning out your vanity or helping you shop the beauty aisles, keep reading my blog and follow me on social media to be the first to get the scoop on how we can make it happen. Cheers to the good things to come in 2016!